Mussorgsky is a cause needed to be taken up passionately by more conductors. Abbado has been the modern era’s most vital Mussorgskian, followed by Gergiev. There have been excellent occasional advocates, such as Stokowski, Karajan, Knussen, and a few others. Kent Nagano, who conducts here, certainly is enthusiastic, but is unfortunately not in the same league. Otherwise, this is as close to a near perfect Khovanshchina as we are likely to get. The biggest asset here is stage direction by the renowned Dmitri Tcherniakov. Tcherniakov is one of the most celebrated opera directors active today and for very good reasons: He is not gimmicky, does not set out to shock for the sake of shock and never fails to bring new insights to a libretto. It took Tcherniakov’s skillful, well-thought out, elaborate staging to transform this great Mussorgsky opera (never a repertoire staple) into a sell-out triumph for the Bavarian State Opera and Valery Gergiev. 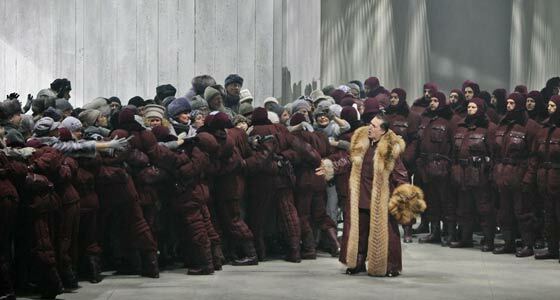 Critics echoed audiences and the result was a resounding, runaway success, followed by this filmed version (with the afore mentioned Nagano conducting the Bayerische Staatsoper). 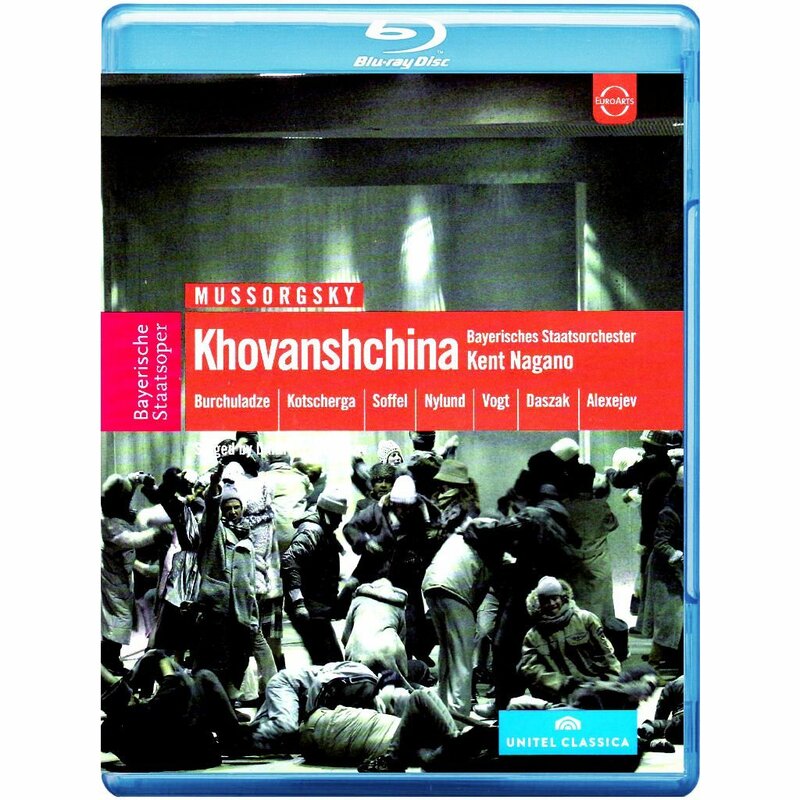 We are fortunate to have access, via DVD, to Tcherniakov’s Khovanshchina. The plot concerns a struggle between religion and secular, political power. Tchernniakov dispenses with the history lesson and catapults the viewer into a grey state of dissolution and eventual chaos. 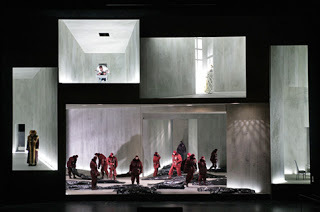 The staging even takes into consideration the incomplete state of Mussorgksy’s opera. Tcherniakov did his homework, restoring the presence of Peter the Great and Sophia (part of Mussorgsky’s original concept). Khovanshchina, like all of this composer’s work, in its original,unaltered form, is a bit of a wild and wooly ride (both plot-wise and musically). The Shostakovich orchestration (which, again, Nagano is ill-suited to) is what is used here, as opposed to Korsakov’s more famous version. That leaves Tcherniakov to visually deal with the plot problems. One such resolution is a tightening of a muddled time line (Tcherniakov stages it one day). Paata Burchuladze is aptly thuggish in the role of Khovanscchina and the mounting tension between himself and the religious leader Dosifey is well captured. Kotscherga takes on the role of Dosifey and plays it in full fanatical mode. The Dance of the Persian Slaves is harrowing and will linger in the mind long after the scene is over. A rapturous finale is visually choreographed to Shostakovich’s overtly celestial chorus. Mussorgsky himself said bringing the past into the present was a pronounced aesthetic purpose in his music. With Tcherniakov’s direction echoing recent turmoil and conflicts within modern Russia, this production succeeds in that Mussorgskian spirit. Only constipated, American opera fundamentalists would raise an objection. You know the type: they bellow, hiss, throw out predictable, and by now quite boring insulting phrases like “eurotrash, beat their chests and throw hostile tantrums. Why? Because they want to keep opera solely in the past. Naturally, there are examples of ludicrous contemporary stagings (i.e. the M22 Ascanio in Alba) but there are just as many, if not more thought-provoking directors dedicated to keeping the profundity of stage direction alive and fresh (i.e. Claus Guth). In the 1980s, Patrice Chereau staged a Ring Cycle. Gone were the cardboard swords and plastic, horned helmets. The traditionalists were outraged. Today, Chereau’s Ring is considered a classic by all, but a few holdouts (who histrionically liken the late director to the antichrist). The offended opera puritans proved to be as antiquated in their thinking as those “King James VERSION only” bible fundies who predicted the end of the world when publishing companies started distributing contemporary versions. Naturally, these puritan opera attitudes are predominant here in the west. It is because of them that opera companies, catering to the ultra conservatives (who feel as if they own the art form) are forced to stage a La Boheme every single season, simply to keep themselves out of the red. Meanwhile, Europe, which has long staged opera in contemporary settings, has a thriving opera scene. Do the math. The supposed American opera fans have killed the art form they claim to love. They have killed it by putting that art form on a pedestal, edifying it, dehumanizing it, and keeping it stale. At the sign of even a single 21st century dress on a singer, these fans will be as sounding brass, wailing blasphemy behind the curtain. It is no wonder opera is in its death throes here in the states? What potential music lover, under the age of thirty, would want to even explore an art form held captive by such a constipated lot? This entry was posted in opera on dvd/blu-ray, opera review and tagged Dmitri Tcherniakov, Kent Nagano, Modest Mussorgsky, opera on blu-ray & dvd, Paata Burchuladze by Alfred Eaker. Bookmark the permalink. Thank you Renato. Be my guest.